A letter marked "Please Forward" and addressed to Don Cockell had been kicking around in Jack Solomons' gymnasium for weeks. Don owned a hairdressing business near my home so I volunteered to deliver it. He and I bumped into each other in the shop doorway and I mean "bumped" – he was going out as I was going in. This was in 1951 when Don was on a run of impressive wins over men like Freddie Beshore, Nick Barone, Lloyd Marshall and Albert Finch. The contest with Finch replaced a world-title challenge against Joey Maxim. Jack Solomons had Joey signed to a firm contract but the Board of Control stepped in and ordered Don to defend his national crown against the Croydon man. A few weeks earlier I'd watched Cockell box an exhibition with Jack Gardner. His superb physique had brought murmurs from an admiring crowd. He was a splendid figure oozing fitness and ambition and gliding around the ring with sparkling footwork. The contrast with the man now standing in front of me in the shop doorway was stark. Now he was sallow-skinned, fat, and had a nasty boil on his neck. This was the man tipped to beat Maxim yet he looked less imposing than the dossers lolling around the park along the road. I was so shaken at his appearance that I nearly forgot the reason for my mission. A few weeks later, Jimmy Slade, an unrated American, wiped the floor with him. Worse followed when Randolph Turpin, still a middleweight, stopped Don in eleven rounds. I thought about that boil and the fat rolls bulging from Cockell's waist and assumed that Don was one of those fighters who didn't train when a fight wasn't in the offing. He'd taken the Slade fight at short notice. If only I'd known then what agonies he'd undergone and how weakened he'd become in his efforts to keep his weight below the light-heavyweight limit! It did register that Don had agreed to meet Slade at the 13 stone limit but his weight problems were a well kept-secret. Glandular disorders wreaked havoc with Cockell's physique. Hard as he tried, he could not control the fat that piled on to his frame and he was forced to compete at heavyweight level in 1952. Don had come back from a bout of rheumatic fever earlier in his career. It was an illness of such severity that he was not expected to box again. Cockell had two attributes going for him: he was resilient and he had guts – the latter in bucketloads. That he managed to make a considerable mark as a heavyweight is a tribute to his courage and burning determination. In 1950 Don had made an incursion into the heavyweight division against that very capable American Aaron Wilson. Wilson was a scourge of European fighters. He'd beaten six continental opponents, five by clean knockouts and then appeared in London where he banged out Jack London in under a minute. Cockell met him punch for punch and points were finely balanced going into round six. Don took a count from a body punch and was adjudged to have been counted out. Most ringsiders thought he was on his feet at "nine" and Don was so disgusted that he pressed for a return. Wilson was a wily and experienced old bird and he eked out a narrow points win to pocket a £500 side-stake. Don vowed to stick to men of his own weight after that. The glandular problem hadn't presented itself and progress was rapid. Within a year he was European champion as well as being the national title-holder. Going into the Jimmy Slade catastrophe, he was leading contender for the world title. In my own opinion, Don was our best ever post-war light-heavy. His ringcraft and footwork backed by a surfeit of courage and adaptability made him an outstanding prospect for world honours. He'd turned pro at 17 and got a solid start by knocking out Trevor Lowder at High Wycombe. Before his baptismal year was over, good men like Paddy Roche, Reg Spring and Jimmy Carroll all tasted defeat at his hands. Only that experienced campaigner from Sidcup, Jock Taylor, blotted his ledger but fighting such opposition in his eighth pro fight was an ambitious move. Cockell was a quick learner and took the odd defeat in his stride. His progress under the astute management of John Simpson was steady. Study the entries on his record for 1948 and 1949 and you'll observe that our man was gaining in experience and fistic stature. His rise to title contention can be charted by a steady learning curve. He was never cosseted by a series of easy fights. Don always seemed to be reaching beyond what could be expected of him and pulled off many surprising wins. His defeat by Johnny Barton in 1948 is an example of how he never trod an easy path. Barton had hurt him midway through the fight. "He was the hardest puncher I ever met," said Don. Yet one month later they met again and the fortunes were reversed. He later failed to do the same against Aaron Wilson but it was a magnificent failure. Don had taken a big step up in class. That year, he knocked out a gutsy opponent in Mark Hart to win the British light-heavyweight championship that had been left vacant by the retirement of Freddie Mills. When his world fell apart and he could no longer compete at the 12stone 6lb limit, his future as a heavyweight appeared bleak. Don was too short, did not possess the reach nor the power to go far. My old pal, Stan Baker, had faith in him and offered Don a fight with Paddy Slavin at Streatham Ice Rink. Don obliged by hammering the Irishman in two rounds and then stopped that hard-punching schoolmaster from Barnoldswick, Frank Bell. Ambitiously, Don challenged Johnny Williams for his British title and upset the odds by forcing the champion onto his backfoot throughout. Cockell was a clear winner. What followed was perhaps one of the most prestigious victories gained by a British fighter in a foreign ring. Don went to the States and beat Harry "Kid" Matthews in the American's backyard. He beat Harry again in London and to prove that he was a genuine contender, Don again journeyed to Seattle and stopped Matthews in seven rounds. He did it in style, too. Harry took three long counts and was utterly spent as the referee stepped in. This win, which followed a victory over Roland LaStarza, catapulted Don into a match with Rocky Marciano for the top prize in boxing. 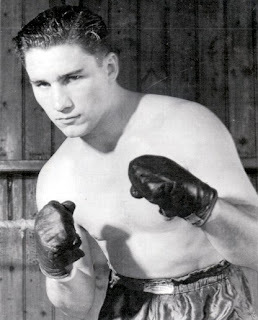 Now, Marciano is often derided in print as being a man with poor defence, who cut too easily and who could be outboxed. Yet I recall that he outpointed master-boxer Ezzard Charles, wasn't expected to match the skills of Archie Moore, but crushed the old Mongoose and dealt summarily with both Jersey Joe Walcott and the aforementioned Harry "Kid" Matthews. Rocky was a powerful champion yet Don may have stood a chance in a large ring, but he and the Rock fought in the smallest allowable space. Any chance Don had disappeared when the bell rang and he was forced to trade toe-to-toe in that small hempen square. The story of Cockell's magnificent and defiant stand against Marciano has been too well-chronicled for me to go into details, but I will say that we all felt 10 feet tall when the newspaper reports hit the streets. "Light the Beacons for Don Cockell", were the headlines in the Evening News. Other tributes were even more glowing. Don was never the same force after that. He'd given his all against Marciano and it was downhill from then on. He had two more fights and lost them both – one against a slugger who would not have been in the same ring in the pre-Marciano days. Don packed it in while we still remembered him for all he'd done for British boxing. In retirement, he took up farming in Horam, East Sussex. He'd been there six months when his wife, Irene, took the family car and caravan and ran off with a 32-year-old merchant seaman called Johnny Clark. Don traced them to a public house in Sevenoaks, confronted Clark and appealed to his wife to come back home. She had known Clark only six weeks but said it was love at first sight. Leaving Don to look after their two sons, she and Clark left for Spain. It was a short-lived affair. Two months later, she begged for, and received, financial help from Don who forgave her and took her back. They had a daughter a couple of years later but a final split came in 1967 and Cockell was forced to sell his farm to pay debts incurred by alimony payments. He took a job on a North Sea oilrig, then managed a pub in Croydon and eventually drifted into a job as a bus driver. He was living in a council flat in Carshalton, his fortune was gone. When his story appeared in a series of biographical sketches penned for a national newspaper, he asked for the fee in advance, such was the parlous state of his finances. He developed throat cancer which was eventually to kill him at the early age of 55. In adversity, the boxing fraternity remembered him. At a dinner attended by many champions, ex-champions, journalists and fans, he sat in a wheelchair, unable to speak because of his incapacity, listening to the thunderous ovation afforded him as his fight with Marciano was recalled. Don was moved to tears. It was an emotional event. Against Marciano on that May evening back in 1955, Don Cockell epitomised all that boxing should stand for. He fought until he dropped, never complained nor made excuses and refused to take the easy way out. He did us proud but that was how Cockell was. He was a champion both in and out of the ring. Excellent tribute to a forgotten champion. Sad ending for a gutsy champion. Gone but not forgotten. I remember a story of him running a pub in Hastings where I grew up. A great character and fighter. God rest his soul. anyone know what time (GMT) the Marciano v Cockell took place , as we as kids listened to the fight with grandfather and Dad ....on the radio ....must have been early in the morning ?